NPA is more than just a company or a job for me. This is a business I have grown with and I believe in. It’s been an adventure working with so many awesome people in an industry where we can live out our passion of riding & helping others succeed! family, never a dull moment when we are together. 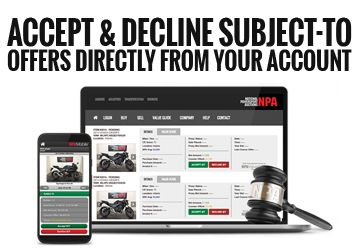 NPA's executive team are the most understanding people you'll meet, which makes work a joy. I look forward to the continuing growth & opportunities. 7 years & I’m still happy to be a part of the team! Prior to NPA, I worked in my family owned dealership. NPA has that same feel, as they make their employees a top priority. At NPA we strive to create a family environment with hardworking, qualified staff. We make sure to attract talented, like minded individuals who share the same passion for the powersports industry. Our success is based on the relationships we've built with our staff, dealers, auctioneers, OEM's and lenders since 1990. The position of a Marketing Representative consists of contacting and notifying dealers about upcoming auctions and events. The job also requires writing emails, managing accounts, receiving inbound calls, and marketing services we offer. We are non-scripted and thrive on building a friendly, but professional relationship with all of our clients. Our customers have gone through a registration process to hold an account with us so very rarely will there be cold calls to make. NPA offers a range of positions nationwide, wide-ranging benefits and ample opportunities to achieve professional growth. We actively search for new talent to help us continue our world-class customer service. If you enjoy working in an exciting industry and are looking for an opportunity to become a part of a world class team, apply online today. We offer four medial plan options provided by Aetna for all regular, full time employees. The flexible plan allows you to choose network or non-network providers. Individual and family plans are available. Delta Dental provides great coverage at a low cost to employees. All regular, full-time have the option to add dental coverage for a small fee. All plans are offered to employees and their families. All regular, full time employees can participate in vision coverage through EyeMed Vision Care. Employees are offered Flexible Spending Accounts to include Health Reimbursement and Dependent Care. Employees have the option to elect a Health Savings Account while enrolled in a the High Dectuble Health Plan, a plan that can help you save for future medical expenses. After 60 days of employment, all regular, full-time employees are eligible to participate in our 401(k) Plan with Voya. The Employee Stock Purchase plan allows you to purchase full shares of Copart stock at a 15% discount.